Book your MOT in Whetstone online today, using our live online MOT booking system. Get in touch today at Beaver Test Station in Leicester. Give us a call on 0116 284 4873 or drop us an email on mot@beaver-bus.co.uk. Class 4, 5 & 7 MOT tests. We are one of the few MOT testing centres to offer MOTs for motorhomes in Whetstone and surrounding areas in Leicester. Its never been easier to book your MOT online. At Beaver Test Station in Whetstone our expert technicians offer exceptional services and customer care, for MOT, servicing, Tyres in Whetstone come to us and let us become your number one car garage in Whetstone. Our large facility in Leicester will accommodate any size vehicle and we specialise in motor homes and Recreational Vehicles (RV’s) which we have equipment to test to the required standard. At Beaver Test Station in Whetstone or as we are also known Beaver Bus we are a family run business with over 25 years in the Transport industry. We have a purpose built Class 4, Class 5 and Class 7 MOT facility where you can leave your vehicle with us for its MOT or we will complete it while you wait (usually around 50 minutes) in the comfort of our new waiting area. We also offer voluntary brake, light and smoke testing at our garage in Whetstone. You can book your MOT in Whetstone with us using our new MOT Online Booking System. Simply select the type of MOT you require and follow the instructions on screen to book your Class 4, 5 & 7 MOT at any time of day or night. Our large facilities in Whetstone mean that we are able to admit all types of motor vehicles for car servicing, maintenance and car repairs. We also specialise in motorhome's and RV servicing. As part of your car servicing in Whetstone, our experienced technicians will thoroughly check your car for any signs of wear and tear and undertake any required maintenance. We will check the oil and brake fluid and top up as necessary. If there is anything in particular you would like us to look out for during your car servicing, please let us know when booking. 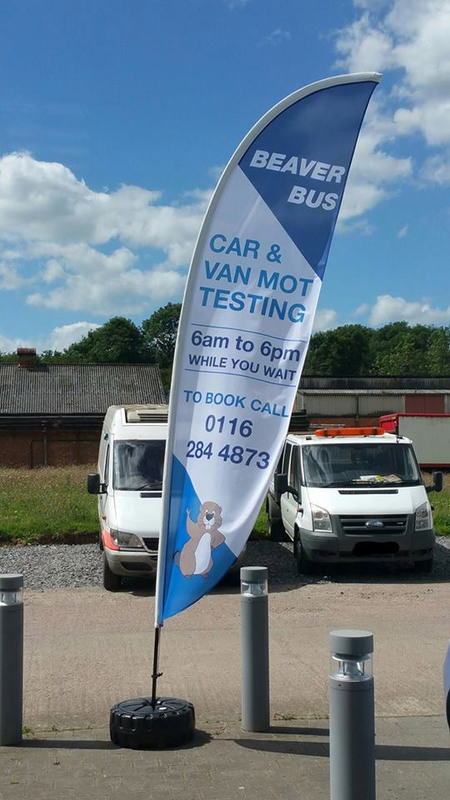 To book your van, motorhome and / or car servicing in Whetstone, Leicester at Beaver Test Station please call 0116 284 4870 or send us a message using our Contact Form to find out more information. Beaver Test Station has a huge range of quality tyres in Whetstone available both in stock and available to order for all types of vehicles. We are able to fit new tyres in Whetstone to cars, vans, motorhomes - even buses! Use our Online Tyre Ordering System to place your tyre order and book your tyre fitting at a time that suits you. Remember you can book your tyres online 24 hours a day, 7 days a week. Alternatively, call us on 0116 284 4870 to check availability or to order your new tyres in Whetstone from Beaver Test Station. Here at Beaver Test Station in Whetstone we are a Authorised Test Facility (ATF) which makes us able to perform annual MOT testing on buses, lorries and trailers. For more info on our MOTs or for more information on our MOT services we offer in Whetstone please call us on 0116 284 4870 or send us a message using our Contact Form for more information. Beaver Test Station in Whetstone, Leicester offer DVSA Testing for MOT Testers and Driving Instructors. Please call 0116 284 4870 or send us a message using our Contact Form to find out more information. Book Your Free Check Now!